Home to the highest peaks in New England, it’s no surprise that skiers and snowboards love to hit the slopes in New Hampshire. From larger family-friendly mountains like Loon in Lincoln, to smaller sportier resorts like Gunstock in Gilford, options abound for snow bunnies in the Granite State. And luckily—especially for the non-plankers and knuckle-draggers among us—there is also a wide variety of après places. Classic ski bars, trailside fondue, awesome tunes, and a prohibition-era speakeasy are all alive and well here, so consult this guide when you want to sip, snack, and have a good time in New Hampshire. Just two hours from Boston, Loon Mountain is one of New England’s most popular—and the region’s most accessible—big mountain resort. And the Paul Bunyan Room is by far the most vibrant, active après venue in the area. After a long day making first tracks on the milk run, locals and visitors hit the bar in the Octagon Lodge at the base of Loon Peak. Inside, the bar has a classic ski bar feel: a roaring fire to warm up by and paintings of everyone’s favorite lumberjack hero lining its walls. Outside, the wrap-around deck (which overlooks the base lodge) is a great place to bask in the sun when the weather is nice. Grab some grub from the restaurants downstairs before heading up to enjoy one of the 24 craft beers on tap and be sure to stay for the music, specifically the Bunyan’s “Legendary Nights” concert series. It’s a big draw for Lincoln and keeps the party going into the night. After a day of shredding at Bretton Woods, you’ll want to partake in an après beverage at the Slopeside Pub & Restaurant, on the second floor of the main lodge. Built in 1902, the Mount Washington Hotel harkens back to a more glamorous age and walking into The Cave, a charming speakeasy in the hotel’s basement, is like walking into the past. With vaulted brick ceilings and original stonework, the dimly lit bar serves up classic libations—such as Prohibition punch in a dainty teacup, late-night eats, and spreads served in Mason jars. The once-illegal establishment also has late-night live entertainment and hosts jazz weekends and Prohibition-era cocktail receptions. With an inventive menu—think open-faced, melted brie grilled cheese, countless burger varieties, and creative salads—T-Bars, one of four on-mountain restaurants at Waterville, is a slope-side favorite for post-run bites. Definitely order their signature Bloody Mary or a Dark 'N' Stormy to go with your sandwich, but beware…while these watering holes are ideal for groups because of their casual vibe and energetic bands, they can get crowded. 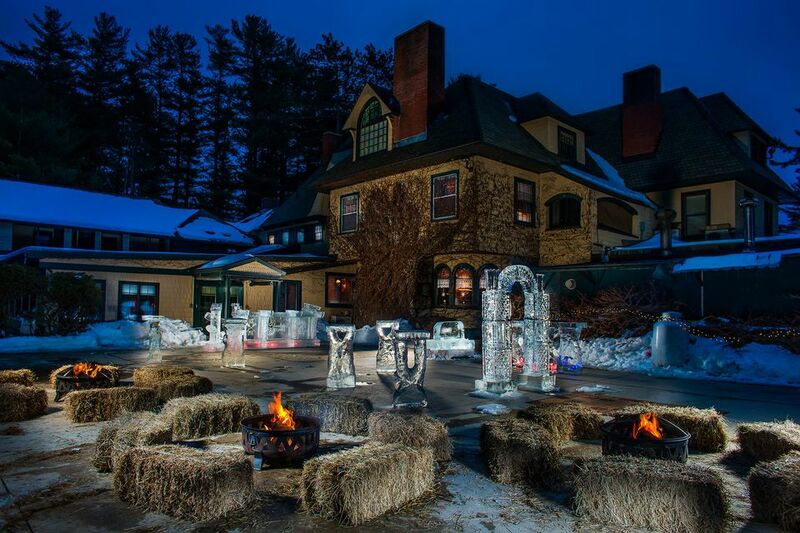 Also at the Waterville Valley Ski Resort, located in the heart of New Hampshire’s White Mountain National Forest, you’ll find the mid-mountain Sunnyside Timberlodge and Buckets, Bones and Brews on the base lodge porch. Or, venture away from the mountain to the raucous Mad River Tavern and into town to Coyote Grill for a rustic, fine dining experience. Après-ski in Gunstock revolves around The Powder Keg Lounge in the main lodge for a warm and inviting scene with live acts and traditional pub fare, like burgers, nachos, and buffalo tenders. If you’re chilled to the bone, opt for a cup of chili, a bowl or chowder, or one of many hot specialty drinks. The bar's coolest feature? Four of the mountain’s original 1937 single-seat lift chairs are from the first-ever chair lift in New England. And if you want a more adventurous alternative for imbibing, ski down from the mountain’s summit to the Panorama Pub for stunning views of nearby Lake Winnipesaukee. Cross country rippers can ski in and out right from the door of the Stonehurst Manor in the White Mountains, making it a top après gem in the area. Dip into the daily afternoon fondue by an open flame in the Library Lounge or sample something from the small shares menu, which includes beef tenderloin crostini and truffled french fries. The A+ mixology staff at the oak-paneled library stirs and shakes up some impressive tipples and each January, talented carvers transform tons of ice into a full-sized outdoor ice bar. Complete with frozen tables and chairs, on the porch outside the Library Lounge, you can bundle up, grab a spot by the fire pits, and indulge in hors d’oeuvres and sunset vibes as long as you want.